Researchers from the Chinese Academy of Sciences' Institute of Metal Research developed a way to turn graphene into porous three-dimensional 'foam' using chemical vapor deposition (CVD). This 'foam' has extremely high conductivity and when permeated with a siloxane-based polymer it results in a composite that can be twisted, stretched and bent without harming its electrical or mechanical properties. This foam has a unique network structure, large surface area, very low density and outstanding electrical and mechanical properties. 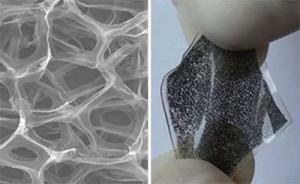 This can find uses in many fields- flexible electronics, fuel cell electrodes, biomedical supports and more.